Mega Millions biggest jackpot ever was won on October 23rd 2018. But, the lottery fever is not over yet! After a $1.53 billion Mega Millions jackpot won on a ticket purchased in South Carolina, Powerball is tempting lottery fans with a $750 million top prize. 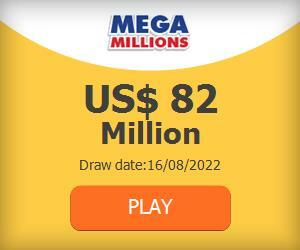 Have you played the Mega Millions historic draw? If you were not the lucky ticket holder from South Carolina, do not worry! It’s never too late to become an American lottery winner! Your chance lies with US Powerball now, who displays an appealing jackpot for this Saturday’s draw: $750 million. The US Powerball jackpot has been rolling over since August 11th, 2018, when a $245 million prize was won. Later won by the forty-two-year-old Nandlall Mangal from Staten Island, this was the 6th Powerball jackpot of 2018. The largest one was worth $559.7 million and it was won by the Good Karma Family 2018 Nominee Trust on January 6th, 2018. But, the jackpot on offer right now is even higher! The $750 million Powerball jackpot is not the highest prize in this American lottery’s history. However, if it is won on Saturday’s draw, it will occupy a 3rd position in Powerball’s top biggest jackpots. If nobody matches all the winning numbers, it will continue to grow, and, hopefully break new records. Another billion dollar jackpot ? Despite the recent lottery fever generated by Mega Millions, Powerball is still the holder of the world record with the $1.58 billion jackpot delivered in January 2016. But, Mega Millions has broken part of Powerball strength: the $1.53 billion jackpot is the largest win on a single ticket. That’s a record formerly in Powerball’s portfolio, with the $758 million jackpot won my Mavis Wanczyk in August 2017. Will we see another record? Will we see another billion dollar Powerball jackpot? The bigger the top prize gets, the faster it grows. If during the first rollovers, the jackpot grows by $10 million, in peak times, we can see even half a billion added up when nobody matches the winning numbers. For instance, the month of January 2016 saw a $300 million jackpot in its first days, but in less than two weeks, it reached the incredible $1.58 billion. So, stop dreaming about thing you could buy with such an amount of money in your pockets! You cannot win unless you play. Buy your Powerball ticket right now and you have a chance to become the next winner! US Powerball is the world’s most popular lottery because of one thing: jackpots! With a starting jackpot of $40 million and a world record of $1.6 billion set in January 2016, the Powerball jackpot is what brings lottery players from all over the world flocking. As the jackpot climbs higher, more and more people decide to play. Why? Because with a large enough prize on offer, people look at the long odds, shrug their shoulders, and decide it’s worth it to play. The truth is that these people should’ve been playing all along because you actually have a great chance to win Powerball. People love to disparage the odds of winning the lottery and say that a person’s chances of winning are essentially zero. Not true! 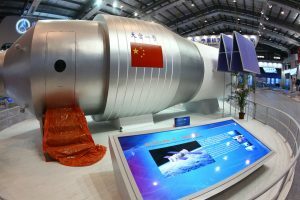 Consider China’s first space station, Tiangong-1, it’s going to make an un-controlled re-entry to Earth’s atmosphere in the near future, potentially raining debris over a portion of the earth’s surface. Even at 8.5 tons, most of the space station is expected to burn up in the atmosphere, such is the incredible amount of heat from friction that will incinerate the majority of the space station. However, some of the strongest, densest pieces are expected to survive and land on the earth’s surface. Fortunately, friction will have slowed the descent of these remaining pieces so they will make impact at a rather leisurely 180 km/hour. What’s the upside? You’ve got, almost, nothing to worry about. You’re chances of getting hit by debris from this celestial craft are smaller than winning the US Powerball. If you’re still feeling worried, play Powerball online and know that you’ve got a better chance of becoming a multi-multi millionaire than having a Chinese space station land on your head. Of course, if you want to have any chance of winning US Powerball you must play the game. US Powerball has draws twice a week that you can play online. Regardless of your nationality or which country you live in, playing US Powerball online is your best option for participating in Powerball draws with an official entry and therefore having a chance at the grand prize. Don’t wait a moment longer, play Powerball online and take advantage of the fact that your chances of winning are better than getting hit by space debris! Can You Win Powerball the First Time You Play? Call it beginners’ luck or whatever you want, but it is possible! Consider these stories of players who scored big wins the first time they bought Powerball lottery tickets. Frederick Walker of Sanford, Florida, who was days away from celebrating his 19th birthday, was eager to play Powerball when the lottery offered its record $1.58 billion jackpot in January 2016. Like millions of people around the world, that incredible jackpot attracted him to the lottery for the very first time. Walker, who said he had never purchased a lottery ticket before, said those pre-selected numbers were as good as any he could have chosen himself, so he purchased the ticket. Walker’s ticket matched the five main numbers that came up the draw, but didn’t match the Powerball, which would have entitled him to a share of the record jackpot. Still, Walker’s prize was worth a cool $2 million because he had included the Power Play option on his ticket. “How lucky that the first time I played, I won!” Walked said when he showed up in Tallahassee to claim his prize. Here’s another story of a big lottery winner who demonstrated beginners’ luck. Linda Quam, a resident of Washington State, purchased a Powerball ticket for the first time in November 2014. She became the sole winner of a $90 million Powerball jackpot! Quam and her husband had stopped to buy a newspaper and some pumpkin spice. 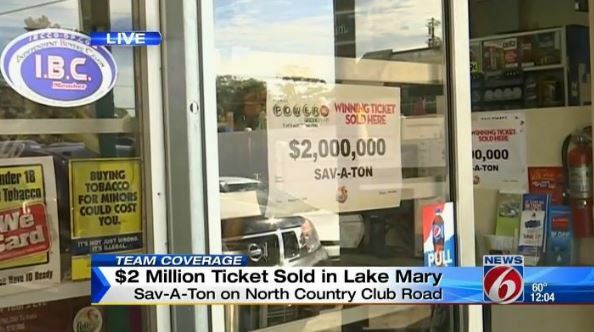 As they were waiting in the checkout line, they wondered if the should buy lottery tickets. “The cashier was really nice and asked if we wanted to purchase Powerball. I said, ‘Sure!’ I had never purchased a Powerball ticket before,” Quam said. Although Quam had played scratchcards for some time, the Powerball jackpot was quite obviously the biggest prize she had ever won. And this came after she played the lottery for the very first time. Can you win Powerball the first time you play? You won’t know unless you try. Buy your Powerball tickets in time for the next draw! First thing you should do when you play and win the Powerball jackpot? If you’re asking this question, you are probably fantasizing about the day when you will win the jackpot. Perhaps you will win $40 million, or maybe you will win a share of a billion dollar jackpot. No matter how big your prize might be, it’s still quite a lot of money. Your first instinct is to spend your newfound wealth. Buy a new home. Purchase a new car. Purchase another new car, a plane, a boat. Travel around the world. All of these luxury purchases are very tempting, and you will certainly have enough money to afford the expense. Perhaps you desire to show off your wealth. Living the jet set life, owning a mansion, hiring a chauffeur, drinking champagne. If you go in this direction, you must be careful! Your sudden wealth might lead you down the wrong path, into a world of drugs and worse. You might be generous with your sudden windfall. You will put aside money for your children’s education, help your family, donate money to worthy causes. All of this is very considerate of you. You can afford to share the wealth. You may think of purchasing real estate, investing in a new business, buying a share of an existing business. But whatever you are considering, you must be aware that there are dangers involved. If people learn about your lottery win, they’ll come knocking on your door. Distant cousins, friends, coworkers, and more. People you’ve never met, organizations you’ve never heard of before. You’ll receive business propositions left and right, some of them quite interesting and others a bit farfetched. You have the money, and everyone wants a piece of the pie. So, what should you do with your Powerball money? The first thing you should do after you win the Powerball jackpot is to do absolutely nothing. You heard us right. You are entitled to celebrate, but, you have some important decisions to make. Therefore once you calm down you can begin to plan the rest of your life. ‘Plan’ is the key word here, as you want to take the necessary steps to ensure that your wealth doesn’t disappear as quickly as it came. That is why you need to put together a team of professional advisers. You will need a lawyer, a tax attorney, a financial adviser, and possibly others. This team will advise you how much money you can spend now, and how you will be able to plan responsibly for the future. One of the first decisions you will have to make is whether to remain anonymous or not. Sometimes, this decision isn’t even up to you to make. In some states, you must identify yourself as the winner of the jackpot. There are ways around this, as your advisers will explain. Perhaps you can set up a trust, or some sort of legal entity, to claim the prize on your behalf. Therefore, you should take things slowly. That is really the first thing you should do. Congratulations on your win! And if you haven’t yet won, now is the time to play Powerball! By the way, it’s never too late to play the lottery! Good luck! We’re in the middle of November which means those of us in the northern hemisphere are getting ready for winter and the holiday season. While the weather might be turning a bit frosty in your neck of the woods, there’s no reason to panic about having to buy your Powerball tickets in the thick of a snowstorm or deep freeze because you can simply buy them online. That’s right, play Powerball online from the comfort of your own home, no matter what the weather is doing. 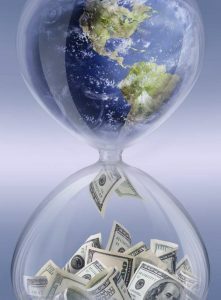 People all around the world play the lottery for one thing – to win. The excitement in getting a lottery ticket and imagining what to do with the money is what it’s all about. Now imagine winning on your birthday – because that’s what happened to one lucky guy not too long ago. 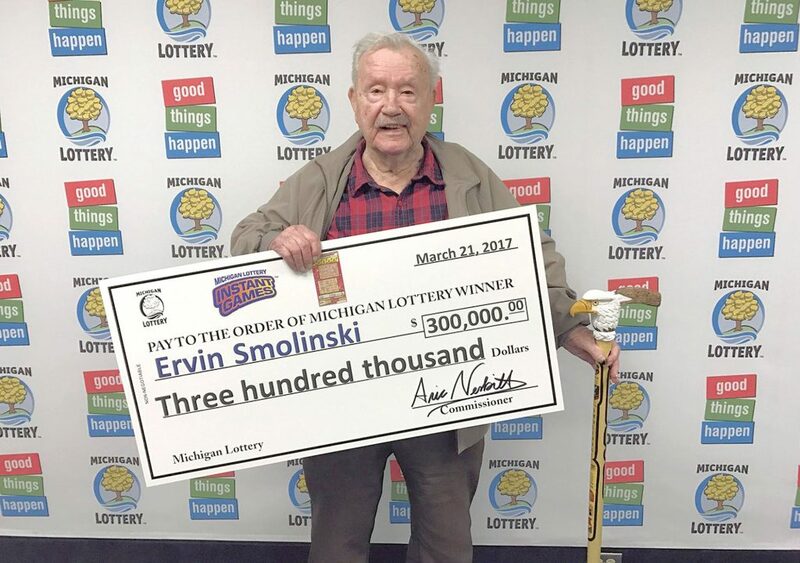 Ervin Smolinski, a World War II veteran, got the birthday gift of a lifetime when he won $300,000 in the Michigan Lottery on his 94th birthday. In addition to celebrating reaching the ripe old age of 94 he had about 300,000 other reasons to celebrate. Even at 94, you can imagine that his big win put quite the spring in his step! This enthusiastic lottery player likes to share his love for the game; Smolinski also purchases lottery tickets for his relatives, as birthday gifts. A few years later, Smolinski’s family decided to purchase some lottery tickets for him for his birthday as a gift. Smilonski received a scratch card from his daughter-in-law that turned out to be a $300,000 winner! The Michigan native plans to use his newfound fortune to renovate his house and buy a new car. However, he plans to maintiain the same lifestyle that he had before his incredible wins so that he’ll have something to pass on to his children. The winning numbers for Wednesday’s draw were 12, 14, 20, 21, 34, and Powerball 22. While no one won the jackpot there was a $1 million prize second place winner! In total, players won just over $4 million in secondary prizes in the last Powerball draw! The jackpot for the next draw on Saturday, November 11, 2017 will be $90 million. Don’t wait until it’s your birthday, especially your 94th birthday, to play Powerball! Rain or shine, hot or cold, you can play Powerball online from the comfort of your own home! Play Powerball now for your chance to change your life forever!